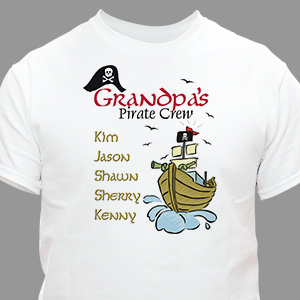 Grandpa and all of his First Mates will be sailing the Seven Seas on these Pirate Crew Personalized T-Shirts. This Pirate Crew Personalized Shirt makes a fabulous Father's Day gift or as a special birthday gift. Our Personalized Pirate Crew T-Shirt is available on our premium white 100% cotton T-Shirt, machine washable in adult sizes S-3XL. Also available in Ash Gray. Includes FREE Personalization! Personalized your Pirate Crew T-shirt with any title and up to 30 names. My father wss very pleased with his t-shirt. He called us agin at home and thanked us.I couldn't believe how fast we got it.